Hortus Camdenensis | Citrus x paradisi Macf. Probably a hybrid of Citrus sinensis (L.) Osbeck x Citrus maxima (Burm.) Merr. A rounded tree, sometimes spiny, with glossy green, oval leaves and large, white flowers followed by large, globose, thin-skinned, juicy, yellow-orange fruit, the pulp white, pink or red. [RHSD, Hortus]. Captain Shaddock is reputed to have brought the first seeds of Citrus maxima to Jamaica and subsequently to have bred the Grapefruit. First recorded in 1750 from Barbados. 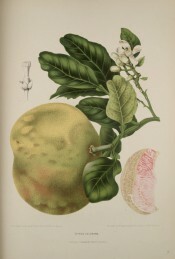 Figured in Fleurs Fruits et Feuillages Choisis de l’Ille de Java [van Nooten/1880]. The figure shows a pink-fleshed fruit. Listed in all published catalogues as ‘Forbidden Fruit’ [Orange tribe no.18/1843]. This plant was originally received per ‘Sovereign’ in February 1831 [MP A2948]. Often mis-identified with the Shaddock, Citrus maxima (Burm.) Merr. which see. The common name Pomelo or its variations is often applied to both Citrus x paradisi Macf. and Citrus maxima (Burm.) Merr., adding to the confusion between these plants. Citrus decumana L. is often given as a synonym of Citrus maxima (Burm.) Merr. According to ‘Sorting Citrus Names’ Citrus decumana L. nom. illeg., which I take to be Citrus decumana Murr. non L., applies to this plant while Citrus decumana L. applies to the Grapefruit, Citrus x paradisi Macf. [www.plantnames.unimelb.edu.au/new/Citrus.html]. More details about Citrus x paradisi Macf.